From the Cookbook to the Community: Who are Master Food Volunteers? The famous red and white cookbook Joy of Cooking is a timeless classic for any kitchen, and it’s referenced throughout the training manual for the Virginia Cooperative Extension Master Food Volunteer program. Just as Joy of Cooking educates its readers about the food they are preparing, Master Food Volunteers (MFV) are able to reach and educate people around Virginia about food preparation, nutrition, food safety, and physical activity. The program allows volunteers to merge their appreciation of cooking, nutrition, and physical activity with the act of helping others. Melissa Chase, Master Food Volunteer Virginia State Coordinator, states that an aspect that draws people to this program is “their love of cooking,” although their love for volunteering fuels their passion as well. One of the requirements to become a Master Food Volunteer is to complete a mandatory 30-hour Master Food Volunteer training course and then reciprocate with 30 hours of service within one year of training. Once the volunteers are trained, they are able to work with a number of different programs aiding in the expansion of program activity. The more volunteers that are trained, the faster Extension is able to educate Virginians about food and physical activity. While the program is small compared to the Master Gardener program, Chase states that it continues to grow. The Master Food Volunteer Program started with about 50 volunteers, but currently has 200 – 225 statewide. The program has grown through the volunteers’ participation at farmers markets, health fairs, and by word of mouth. “They probably see more people at the farmers markets programs, if it is located in a fairly high-volume area,” states Chase. In addition, a lot of communities are putting on health fairs now, which allow Master Food Volunteers to exhibit the behaviors of preparing safe and nutritious food. “The thing that I hear the most is that the volunteers are really interested in helping people to make better choices and improve their eating behaviors. It is an important part of service,” states Chase. There are also a lot of opportunities in the program to reach children. “If you can get [children] excited about preparation, then their families are more likely to get involved.” The Master Food Volunteers can show them different, tasty ways to prepare food that provide people incentives to go back and prepare the same dish at home. The program enables the community to be involved in the food preparation process, while also working hands-on with food that they love. There is a growing interest for Extension Master Gardeners to also become Master Food Volunteers because there is a relationship between how people harvest food and how they prepare food. “We see the connection between being a Master Food Volunteer and the Extension Master Gardener Program, because it is a continuum. Master Gardeners really bring an element to this that we haven’t seen before, because we can talk to people about where their food comes from,” explains Chase. The Master Food Volunteers can then demonstrate what can be done with the produce once it is harvested, making it a collaborative effort. 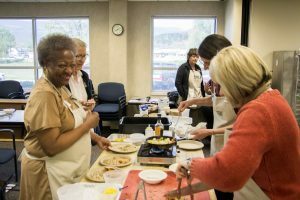 Even though many volunteers are drawn to the program for their love of cooking, many leave with more than they bargained for. Volunteers are setting the example for the community to follow. “Volunteers come in by participating; they can make changes and become healthier by being in the Master Food Volunteer program. They can really be the example that others need to see to make those changes. They can reach the public more easily than we can. They’re a living example,” says Chase. By becoming a Master Food Volunteer and an Extension Master Gardener, new skills can be brought to the table that allow Extension to better reach the public. “Volunteers can do things that we probably couldn’t do without them,” states Chase. “When they can bring those skills, it really strengthens the program. We value that.” Just as Joy of Cooking brings different ingredients together to make a spectacular dish, Master Food Volunteers and Extension Master Gardeners bring together different skills that greatly benefit their communities. To learn more about the Master Food Volunteer program, visit their website here.